For you we operate Hero Zero for free and hope that you enjoy the game. Advertisement flashes helps us to continue developing Hero Zero further. That is why we ask you to keep the ads activated and not to use an AdBlocker. P.S. Donut-buyers play Hero Zero off course completely ad-free. You were logged out of the game. You either logged out yourself or were inactive for more than 30 minutes and were logged out automatically for your own security. You can deactivate the automatic logout by logging on again and going into your account settings via the tool menu in the lower right hand corner and un-ticking the “Automatic Logout” checkbox. Every TV in the city is showing a test image. You get right to it and start notifying all the TV stations! The waiting time will be shortened as soon as video finishes. You’re almost there! In order to start playing you just need to click on the button below. When your browser’s dialogue window opens, just click “Allow”. You’re almost there! In order to start playing you just need to click on the i- or padlock button next to the address bar. 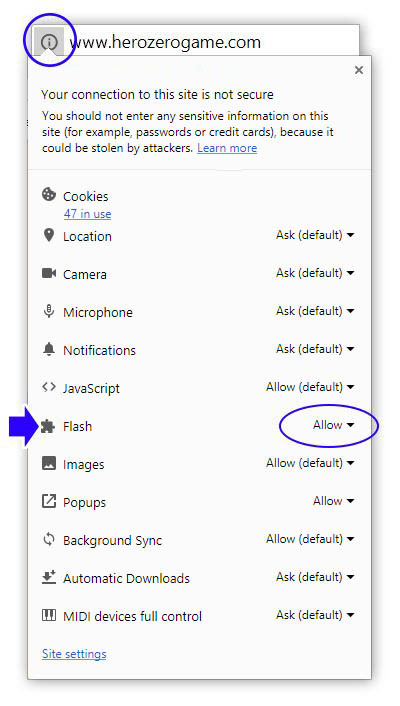 When your browser’s dialogue window opens, just click “Always allow” for Flash. Did you know? With the HTML5 version, you can also play without the Flash plugin. You can switch back and forth between versions at any time.